The Super Scanner is a high performance hand-held metal detector designed to meet the exact requirements of the security industry. Typical uses will include body search for offensive weapons in crowd control, airport and border security, checking parcels and letters for metal objects and anywhere that hidden metal needs to be detected. Hand held Metal Detector designed to safeguard security-sensitive areas. Like schools, courtrooms, corrections facilities, sports events, businesses, night clubs, bars and other public areas and events. 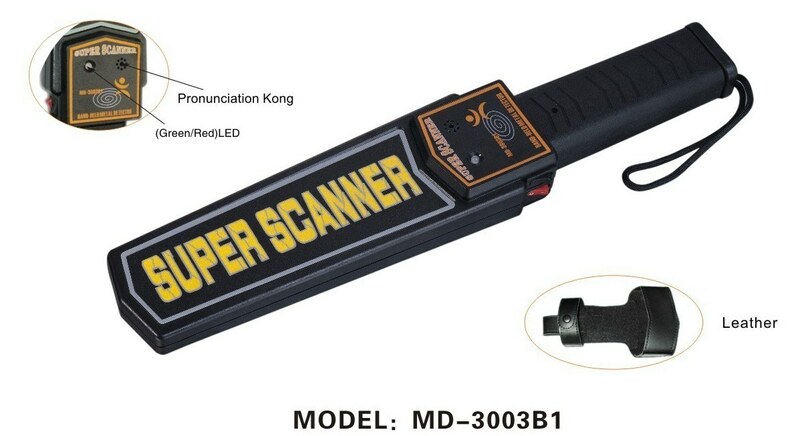 The MD-3003B1 super scanner is a high performance Hand Held Metal Detector. Designed to meet the exact requirements of the security industry. Typical uses will include body search for offensive weapons in crowd control. Airport and border security, checking parcels and letters for metal objects and anywhere that hidden metal needs to be detected. Performance The sensitivity of the detector is determined primarily by the size, shape and composition of the object to be detected.